# Tie dye pattern. # Drawstring waist style / pockets on both side. Color : Black ( your computer's color resolution and monitor may render color slightly differently). Waist between 22" - 44" / 56 - 112 cm. # Wide leg pants / Wrap leg styles. # Very comfortable / Light weight. # Perfect to wear for any occasional, casual wear, indoor and outdoor activities. Hip - 46" / 117 cm. Size :One size - suit for M/ L.
Waist between 21" - 45" (Max Stretch)Each Thigh - 25". # Wide leg pants / Lagenlook style. # Elasticated band at waist. # Very comfortable / Light weight. Color : White ( your computer's color resolution and monitor may render color slightly differently). Hip - 50" / 127 cm. @@ Product Care @@. # Wide leg pants / Leaf pattern. # Very comfortable / Light weight. Inseam - 28" / 71 cm. # Wide leg pants / Water drop pattern. # Very comfortable / Light weight. Inseam - 28" / 71 cm. # Wide leg pants / Wrap leg style. # Very comfortable / Light weight. # Perfect to wear for any occasional, casual wear, indoor and outdoor activities. Hip - 46" / 117 cm. 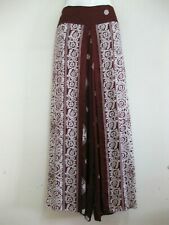 Size :One size - suit for M/ L.
# Wide leg pants/ Beautiful Thai pattern. # Elasticated band at waist / Wrap tie front waist. # Very comfortable / Light weight. # Perfect to wear for any occasional, casual wear, indoor and outdoor activities. Material : Quality rayon. Size :One size Length - 42" / 107 cm. Waist between 22" - 45" / 56 - 114 cm (Max Stretch). Baggy Style Pants/Trousers. Made From Very Nice & Soft Material. Each Trouser Has 2 Pockets. # Wide leg pants / Wrap leg style. # Very comfortable / Light weight. # Perfect to wear for any occasional, casual wear, indoor and outdoor activities. Waist between 26" - 38 " / 66 - 97 cm. Yellow ochre colour with blue embroidered. # patchwork pattern. Inseam - 32" / 81 cm. # Cross patchwork # Beautiful rose pattern. Inseam - 30" / 77 cm. Waist fits between 21" - 45" (Max Stretch)Rise - 13". Waist between 22" - 45" / 56 - 114 cm (Max Stretch). Inseam - 30" / 77 cm.
" this is inline with our policies where it is clearly stated what we do and do not cover. We do keep photographs of every item we send out. We cannot be any clearer. Size :One size - suit for S - XL. Color : Burgundy ( your computer's color resolution and monitor may render color slightly differently). Inseam - 30" / 76 cm. Design: Harem Pants. Elasticated waist and cuffs. Slouchy fit. Waist: 14.5 " / 37 cm (elasticated). Leg bottom: 6 " / 15 cm (elasticated). Color: Ink Blue. Inner leg: 27 " / 68.5 cm. These are beautiful tapered printed trousers, imported from India. The material has an elephant / floral pattern. One Size which fits size 8 / 10 / 12 / 14. Waist between - 22" - 45" (Max Stretch)Each Thigh - 26". Length - 42". Waist between 21" - 45" (Max Stretch)Rise - 13". Inseam - 31". Waist between 22" - 45" / 56 - 114 cm. Hip - 50" / 127 cm. Inseam - 30" / 76 cm. # Very c omfortable and light weight.